Record numbers of seabirds have been killed in the recent storms on the Welsh coast, raising concerns some species are at risk. The birds, including razorbills and puffins, have been washed ashore on beaches across Wales. The Wildlife Trust said many of the birds died from malnourishment because they found it difficult to find food during the storms. An additional 11,000 puffins have perished in the storms in France. The Wildlife Trust of South and West Wales said many birds have been washed up on Welsh beaches including Newgale, Broad Haven and Ferryside. The trust, which manages the important seabird islands of Skomer and Skokholm on the Pembrokeshire coast, said birds had been badly hit by the storms. 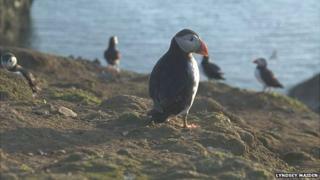 "The birds have struggled to feed, probably because the sea is so rough," said Skomer warden Ed Stubbings. "They would normally sit on the sea and dive under to catch fish, but if the top few metres are churned up they find it difficult to find food in this way." Wardens and volunteers visited the beaches last weekend to try and establish why the birds have been dying. "We found around 60 dead seabirds, almost half were razorbills", said Mr Stubbings. "Like wrecks of birds recorded elsewhere on the coast, many were clearly malnourished, and had suffered badly in the stormy conditions." The deaths of birds in Wales follow those of around 11,000 in Brittany and Normandy, some of which are thought to be from Wales. The puffins were believed to have been in moulting season, growing new feathers, which means they were unable to fly and were stuck in the storms. Dr Lizzie Wilberforce, Conservation Manager with the Wildlife Trust said: "We are recording declines in breeding success of many colonies which we believe to be connected to climate change. Together with storm impacts and pollution events, we have reason to be very concerned for these iconic species." The Wildlife Trust have asked for anyone who finds a bird with a ring on its leg to report the numbers to the British Trust for Ornithology (BTO).